The infantry unit leader's responsibilities include assisting commanders and operations officers in the training, deployment, and tactical employment of rifle, weapons, LAR, and antitank platoons/companies and infantry. LAR battalions are proficient in all the infantry weapons systems. A Marine Corps infantry unit leader is Marine Occupational Specialty 0369, commonly referred to as MOS 0369. This is a PMOS or primary type of MOS and the rank range is from Master Gunnery Sergeant to Staff Sergeant. The infantry unit leader is a non-commissioned officer. These Marines supervise and coordinate the preparation of personnel, weapons, and equipment for movement and combat. They establish and operate unit command posts, as well as the fire and movement between tactical units. They oversee the fire of supporting arms, and the unit's resupply and casualty evacuation effort. As a Platoon Sergeant or section leader in the rifle, scout sniper, weapons, heavy machine gun, LAR, and anti-armor platoons, the infantry unit leader advises the platoon commander on all issues of discipline, morale, and welfare. You can refer to NAVMC Directive ​3500.87, the Training and Readiness Manual, for a more comprehensive listing of duties and tasks associated with the position of infantry unit leader. 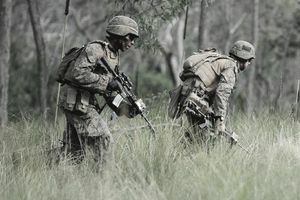 Job requirements include completion of the Infantry Unit Leader Course at either SDI, Camp Pendleton, California or SDI, Camp Lejeune, North Carolina. Applicants may also qualify if the held one of several other MOS positions, including MOS 0311, 0313, 0331, 0341, 0351 or 0352, at the time of selection to Staff Sergeant. Candidates who make Staff Sergeant while in one of the qualifying MOS positions that are mentioned above might not have to attend the school training programs provided that their dates of rank occurred prior to October 1, 2015, which was when this PMOS first went into effect, because it's generally presumed that they have already received sufficient on-the-job training. Most MOS 0369 personnel are career infantrymen who have progressed through the ranks of these other MOS enlisted infantry positions. Security requirements include Staff Sergeant through Gunnery Sergeant Secret Security Clearance, Master Sergeant Secret Security Clearance, and/or Master Gunnery Sergeant Secret Security Clearance. Applicants must also be eligible for Top Secret Clearance. As of July 2017, Marines who are eligible for promotion to the rank of Gunnery Sergeant must have the 0369 MOS. They're eliminated from the promotion board population without this MOS. Some of the above information is derived from MCBUL 1200, parts 2 and 3.